Why do we struggle with making birthday cards for the men in our lives? For me, it's because I feel certain embellishments are "off-limits", i.e. ribbons (hemp, twill and twine are acceptable), buttons, flowers, glitter, scalloped borders and anything "bling". September is a busy month for birthdays in the Moore family. I have 2 nephews and my oldest son celebrating birthdays in the same week. So, I made several cards using different sheets of patterned papers to complete these cards. The SU! 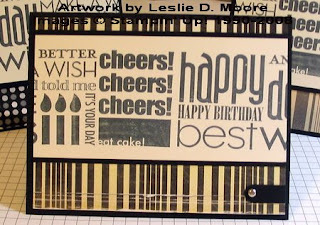 Jumbo Wheel, "All Holidays", was used with Basic Black ink for the focal image/sentiment on these cards. I really like a stamp that has a variety of words and fonts on it, so this stamp was a keeper. I matted the focal image on SU! Basic Black card stock and adhered it to patterned papers from Crate Paper, Rusty Pickle and DCWV. Using the SU! window punch, I made the lower embellishment and mounted it with a simple silver brad. Sweet and simple for the September celebrations! Nice job on our male birthday card. I love it. Its perfect. And your right, its hard because you cant use the things we all love to use, the ribbons, flowers and all the bling. Awesome masculine card, Leslie!! I actually bought this wheel and have never used it. I have a lot of stamps that still needs to be inked. You did a wonderful job with your card. Perfect for a male! !